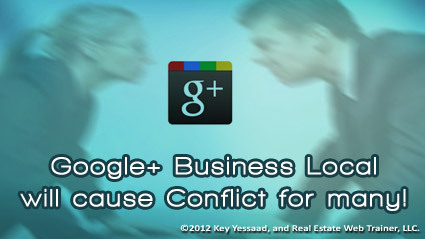 2013 will be the year when Google Plus Local will cause many Real Estate Brokers and Agents to have major conflicts. It has already started but I predict it will be more pronounced in the coming year – so what’s the problem? Many Real Estate Agents are savvier about Internet Marketing, SEO, and Social Media than their Brokers; so when they notice something happening on the internet they tend to embrace it more quickly. Google has launched an initiative in which its search results will be peppered with local Real Estate Business Locations, in effect the 10 results per page has been expanded to 15 to 20 results, with a strong mix of Local Businesses. Savvy agents have been going online and using the ‘Google+ Local Business’ to claim those spots and verifying their location and placing their website rather than the Business website. The conflict arises when another agent at the same location notices that has happened and demands his/her website be the one to be displayed, and the broker of the business location is caught trying to undo something that should have had the Business Location and the Broker Marketing information in the first place. Expect lots of pain! Further the aggregation of data that Google Maps (local), the old Google Places, and the new Google+ Business Local are a mess, and it will take Google engineers months to cohesively connect all three in a logical smooth manner – but Google is known for solving such big challenges, and this one is big. very insightful...this has already happened with me. I received little to zero help from google. Fortunately the issue was resolved however once the business is "claimed" it can not be undone unless the person that holds the claim releases it.